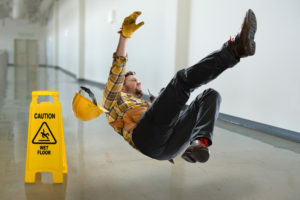 A slip and fall, legally speaking, is an injury in which an individual slips or falls and is injured as a result of a hazard caused by the carelessness of a property owner. Property owner or business proprietors can be held legally responsible and liable for injuries sustained by an individual who slips and falls or another individual or proprietor’s property due to a dangerous environment. Regardless of whether an individual or proprietor is aware of any dangers or hazards on their property, they may still be held legally responsible and liable for any damages incurred. Conditions that are dangerous or hazardous that can cause slips and hazards may include falls from the buildup of ice, snow, water, or other liquids; inadequate lighting, hidden hazards like potholes or sudden changes in the flooring (i.e. rough carpet to slippery marble), and raised or broken sidewalks. Dangerous or hazardous conditions may be obvious, in that they are easily seen like missing steps or railings. Alternatively, such conditions can also be hidden from view, like freshly washed floors without caution signs. Dangerous and hazardous conditions may also be long-lasting, such as a sudden three-inch raised area of a path producing a variation in elevation, or it may be a momentary spill of vegetable oil in the aisle of a grocery store. Dangerous and hazardous condition can even seem to be something ordinary that is dangerous in reality. For example, it can be difficult to notice that floors have been recently waxed without the benefit of a sign. Property owners or managers may not always be liable if an injury occurs on their property. It must be established that the property owner or manager was negligent in their duties of caring for said property. For example, an individual could fall down a staircase as a result of a light burning out right before the individual set foot on the stairs. In this instance, the manager or owner would not be held liable because they could not be found to be negligent in the case — there is not enough time for the manager to reasonably react. However, had the lightbulb been burned out several days before the individual slipped and fell down the staircase, the property owner or manager could then be held responsible. What is a Trivial Defect? The property manager or owner may also not be held liable should the defect in question be determined to be a trivial defect. For example, say the path of a sidewalk suddenly raises a tiny fraction of an inch. even if someone falls and gets injured, the owner or manager would not be held liable because the defect was trivial. In order for someone to be at fault, the sidewalk would have to be raised substantially and it would need to be established that the sidewalk was the reason for the injury. Property owners or managers will legally be considered to have known about a dangerous or hazardous condition existing should it be permanent in nature. This is true regardless of whether the manager or owner actually knows about the hazard. As long as it can be established that the owner or manager should have known about the hazard he or she will be held liable. For example: Going back to the staircase example, say the property manager or owner knew that the light above the stairs was broken for several months, perhaps because of faulty wiring rather than a burned out bulb, yet remained unaware or neglected to opt for repairs before someone fell down those same stairs. In this case, negligence can be proven because the owner or manager should have noticed a broken light over a period of several months and made repairs. As for temporary conditions, the time between the onset of hazardous conditions and an accident can be important in terms of liability. Say a bucket of cleaner spills in a hallway and an accident occurs immediately after. The manager or owner would not be responsible because they did have enough time to put together a response and prevent the injury from occurring. If another individual caused the spill without the owner or manager’s knowledge, the owner or manager would only be held responsible and liable if enough time had passed that it could be determined that they should have known about the spill. An example of instances where knowledge of a danger or hazard can be established: If a motor oil spill was present—in an area not routinely subjected to this type of hazard—for several days before an injury occurred as a direct result of a slip and fall. However, if the oil spills in an auto repair shop in an area where the same spill frequently occurs, the owner or manager will not be held responsible because such hazards are typical of the location/type of work. Compensation for physical and/or emotional distress. Recompense for destroyed or damaged clothing (fairly valued). Lost income from missing work and/or the diminished capacity to work at present or in the future. The Kamran Yadidi Law Group has exclusively handled personal injury and wrongful death cases since 1996. Kamran Yadidi, the firm’s founder, has built his status as an efficacious slip and fall lawyer. Over the past two decades, the firm has accumulated a 98 percent success rate (counting both verdicts and settlements) and won over $200 million in damages on behalf of the firm’s clients. Though Mr. Yadidi and his team have taken on many major cases over the last twenty years and counting, they always strive to offer their services to those whose budgets would ordinarily not allow them the opportunity to hire a skilled attorney. The firm works on a contingency basis, meaning that unless it wins your case, they will not be paid. Granted, this does mean that the firm is more selective in their cases—Mr. Yadidi will only take cases that are likely to yield good outcomes. When searching for a slip and fall lawyer, you should contemplate on the significant resources that a well-established law firm like Kamran Yadidi Law Group can provide. If you or someone you love has been harmed in a slip and fall incident, the Kamran Yadidi Law Group is here to help. To get started, contact us by calling the phone number above or reach out through our contact page.